By the end of this post, I aim to make an injector unlike any other: one that by design makes your DLL not debuggable from UM, makes your pages invisible to NtQueryVirtualMemory and NtReadVirtualMemory, and lets you execute code in target process without even having a valid handle; and while doing this I want it to be compatible with Patchguard, have no kernel driver loaded while the target is running and require no handle at all. Now, this may seem like a stupidly complicated goal, however, it is in fact really simple because Windows will be helping us. Okay so what is so interesting about these you might be asking right now, 0x7FFFFFFEFFFF marks the end of user-mode memory so they are obviously there to make sure it doesn’t leak kernel memory to user-mode. Here’s what makes them so interesting: these constants are hard-coded by the operating systems and are NOT what the processor actually uses to decide whether a page is accessible from cpl3 or not. The first 12 bits (&0xFFF) of a virtual address indicates the offset from the resolved page, the next four 9 bit combinations (&0x1FF000, &0x3FE00000, &0x7FC0000000, &0xFF8000000000) indicate the indices of the entry in the page table, page directory, page directory pointer and page map level4 respectively. These entries, apart from linking to the lower level also contain certain flags like write disable, execute disable, etc; as you can see from the definitions below. Voila, now we have our super-secret page. Now that we are done with hiding the memory, all that is left to do is actually execute it and to do that we will be abusing Copy-on-Write this time. CoW is a technique used by operating systems to save memory by making processes share certain physical memory regions until they actually get edited. We know that ntdll.dll gets loaded for every process and its code (.text) region is rarely modified if at all, so why allocate physical memory for it again and again for hundreds of processes? That is exactly why modern operating systems use the technique called CoW. When a PE file gets mapped, if it was mapped to some other process too and its VA is free on the current process as well, simply copy the PFN and set the flag to make it read-only. When a PageFault occurs due to an instruction trying to write on the page, allocate new physical memory, set the PFN of the PTE and remove the read-only flag. This means that when we hook the DLL by using physical memory we actually end up creating a system-wide hook. How can we hijack a thread with this? Well, let’s pick a commonly called function and hook it: TlsGetValue. Now, the PML4E changes from process to process so the kernel memory we exposed are not accessible from all processes, so we need to find a padding in KERNEL32.dll to check for the pid before we just jump to our stub in our lovely kernel page. As PE regions are always 0x1000 aligned, finding a 35-byte padding will be a piece of cake, as long as we look for 0x00 (page padding) and not 0xCC/0x90 (intra-function padding). In the execution stub, we will have to do some tricks as well. We only want one thread to execute our code, we want to unhook TlsGetValue before we continue execution and I noticed that sometimes the changes in physical memory didn’t instantly have an effect on instructions executed and we want to make sure they are applied, so we will implement three checks at the beginning of the stub. The first spinlock, wait_lock is to make sure the threads entering this stub stall execution until we let it continue from our injector. The second spinlock, data_sync_lock is to make sure the old TlsGetValue data is written back before continuing execution. The final atomic instruction, lock dec, is the complementary part for the lock inc at the beginning of the stub; lock inc stored the amount of threads waiting in the spinlock, and the lock dec atomically decrements this count; as it does that if the value hits zero zero-flag is set and as this operation is atomic this is done only once so we check the zero-flag to decide whether we execute DllMain or continue execution. Forgive me for the hasty image mapping implementation, and the debug code left if there is any. This is meant to be a PoC rather than a ready to go pasta. I'm an independent security researcher and a self-employed reverse engineer; mostly interested in Windows kernel development, low-level programming, and pen-testing anti-cheat, anti-debug, anti-re and anti-tampering software but I also occasionally do machine learning research and GPU accelerated programming. Any vulnerable driver will work really. Nice shot! Your perspective is truly outstanding. What about kernel32 modifications, aren’t anticheats checking for them? Or they are but but period of time between checks is enough for injection? They are but we make the assumption that they can’t check the kernel32 memory between the very little time frame that is hook placed < -> hook removed. I have the following result from the injector. It stops with “[+] Creating import shellcode…” and nothing else. 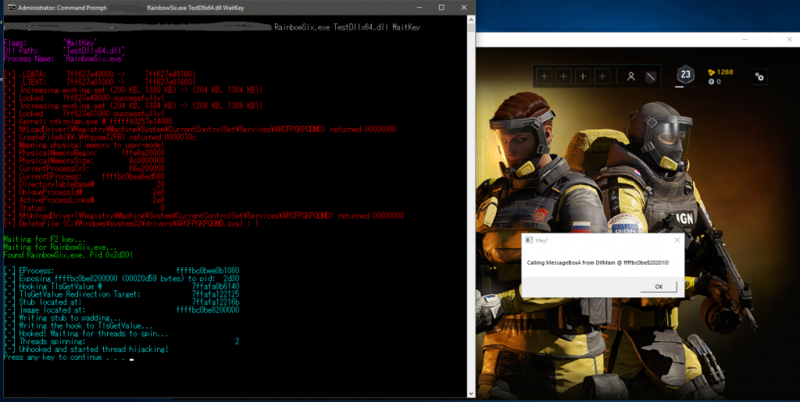 I specify waitkey as instructed but injector does nothing when I start the game and press f2, no output on the screen of injector. I think this is related to this [+] No SMEP support! Any idea about this [+] No SMEP support! ? How do I enable it ? [+] .LDATA: 7ff798f75000 -> 7ff798f753f6! [+] .LTEXT: 7ff798f53000 -> 7ff798f557f8! [+] Increasing working set (200 KB, 1380 KB) -> (204 KB, 1384 KB)! [+] Increasing working set (204 KB, 1384 KB) -> (208 KB, 1388 KB)! [+] Increasing working set (208 KB, 1388 KB) -> (212 KB, 1392 KB)! [+] Increasing working set (212 KB, 1392 KB) -> (216 KB, 1396 KB)! [+] Mapping physical memory to user-mode!